Shiga toxin-producing Escherichia coli (STEC), also known as enterohemorrhagic E. coli (EHEC), or verocytotoxin- or verotoxin-producing E. coli (VTEC), have been linked with severe complications like the hemolytic-uremic syndrome (HUS) in humans. STEC are most commonly transmitted through raw ground beef, raw or inadequately pasteurized milk, sprouts and vegetables. 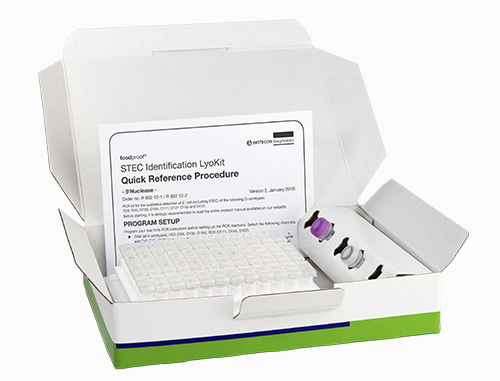 The foodproof® STEC Identification LyoKit can detect and identify the eight most important STEC serotypes O26, O45, O103, O104, O111, O121, O145 and O157 in just one single PCR test. The completely new and unique assay design enables melting curve analysis with sequence specific 5`Nuclease-probes, whereby highest specificity is achieved. The foodproof® STEC Identification LyoKit is in accordance with ISO/TS 13136 and USDA-FSIS method MLG 5B.